Eight of Jon Gordon's most engaging and powerful fables are together in one limited edition box set. The collection will fuel your life, work, and team with vision, passion, positivity, and purpose. Almost half price on Amazon for the holidays! As I walked on the beach a few weeks ago I noticed that certain areas were closed off by fences and signs that said "Sea Turtle Eggs." I remembered reading that female sea turtles swim to shore between May and August to dig nests in the sand and lay their eggs. Months later, the eggs hatch and the baby turtles follow the pure light of the moon back to the surf. In a perfect world, the pure light of the moon guides every turtle back safely to the ocean. However, as we know, we don’t live in a perfect world. Sea Turtle hatchlings instinctively crawl toward the brightest light. On an undeveloped beach, the brightest light is the moon. On a developed beach, the brightest light can be an artificial light source emanating from restaurants, homes and condominiums along the coast. Unfortunately, these powerful artificial sources of light often attract the hatchlings and cause them to move in the wrong direction when they are born. Rather than follow the pure light of the moon to the ocean the sea turtles follow the wrong light to a disastrous outcome. It occurred to me that we humans face a similar challenge. Rather than follow the path we were meant to follow, unfortunately we too often are distracted by things that move us in the wrong direction. Technology, online games, too much time on social media, bad habits, addictions, stress, busyness and meaningless distractions lead us astray. Instead of following the pure light of perfection we allow bright and shiny artificial things to sabotage our journey. Are you following your priorities and pure light to the right destination or are you allowing artificial distractions to lead you in the wrong direction? Are you following the path you were meant to follow or are you letting meaningless things keep you from being your best? The great news is that unlike sea turtles we have the ability to think, adapt and change direction when we realize we are following the wrong path. We can tune out the distractions and focus on our priorities and let the pure light lead us to an ocean of possibilities and a great future! Jon, Dan and Jimmy started a movement with One Word That Will Change Your Life. 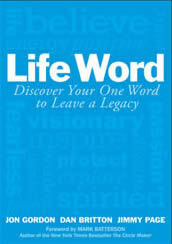 Now they return with Life Word, a new book designed to help you live your best life and leave your greatest legacy. 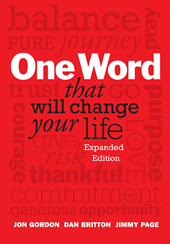 While, One Word is designed to help you choose a word for each year, Life Word guides you to find a word for your life. Think of One Word as a chapter in a book and Life Word as the title. Together they help you define and write your life's story.